People spend hundreds of dollars on a great purse, but not all of us can afford to spend that much on a purse. 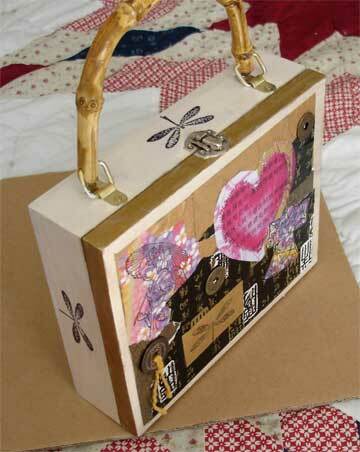 You don’t have to be a crafting expert to make you own cigar box purse. It’s cute and trendy, but pretty much costs you next to nothing. The best part is that you can decorate it exactly how you want. You can make it personal or a certain color to match certain outfits. Either way it’s a great investment of your time, but you won’t have to invest much money into this fabulous purse! If your empty cigar box has stickers or stamps on it that you want to remove you use nail polish remover to get these off. by cutting out a floral shape from an old leather jacket or purse that you are no longer using. Use paints, paint brush and your DIY leather flower to decorate your cigar box purse. Other items that you can use to decorate your cigar box purse include scrapbooking paper, rhinestones, embellishments, beads and anything you have in your craft room. Use your screws and screwdriver to attach the drawer handle to the side that will be the top of your cigar box purse. Use a varnish spray to coat and protect the entire cigar box purse. You’re ready to take your handmade cigar box purse out on the town!